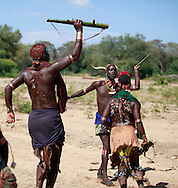 The Hamar or Hamer tribe are agro pastoralists, this means that they grow crops and keep livestock, but they place particularly high value on cattle. They are an extraordinary people with a unique expression and culture. Hamer society consists of a complex system of age groups. Moving from one age group to another involves complicated rituals. 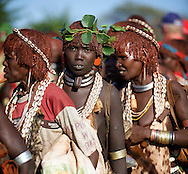 They are a tribe with unique rituals such as a cattle-leaping ceremony that men go through in order to reach adulthood, whereupon young Hamar women get whipped to prove their love for their kinsmen.